Did I mention that I ran into him at a AA meeting? Cause I did. You saw that coming, right? Of course you did. I almost crapped my pants (this was after our first session together). I was hoping that he wouldn’t notice me, but of course he did. If he had the tact that God gave a goat, he would have know that it was Something Never To Be Spoken Of. But our sad divorced fan of postmodern poetry, in the thralls of his crush on our idiot heroine Miss Margo, has no tact and seems to think our mutual presence in AA is something we can “bond” over. He has been demoted from “Tolerable Client: Cell Phone Bill Ain’t Gonna Pay Itself” to “Client to be Seen Only in Times of Acute Financial Distress” to FIRED. Say “Hi” to Dave on Rejected, Fired Client Island, Mr. Crush. He is going to find this, because he is searching Ye Olde Internet for me even at this very moment, I have no doubt. You might think that is vain of me to say that a client would want to, or even could, find my statistically-irrelevant blog in the ever-expanding universe of the internet, but I’ve had clients find me here. Four times, confirmed. 95% sure the Mathematician found it, but I couldn’t get him to confess, so the jury was unable to convict. I know the Surgeon never found it, because if he did, I would not be here typing this right now (for reasons which remain opaque to me, the Surgeon hates the internet. Probably because he can’t control it). When he reads this, it is going to hurt his fe-fes. I hate to be mean, but oh well. I am still so irritated and aggravated that I can’t even publish the conclusion of the Tale of Mr. Crush. I’ve written three drafts and I can’t bring myself to publish them. Do you want to read them? Do you think it’s appropriate to write about him? Forget it, let’s move on before I go crazy. LET’S DO SOMETHING FUN! Readers: help a girl out! The jet-setting Fortinbras, who is in Tokyo or Copenhagen or Paris or other Fabulous Place (I can’t keep up), has given me an assignment. A sort of artistic Scavenger Hunt. Where on Planet Earth is this statue? Can anyone help me out? Does anyone recognize it, or know someone who might? I promised that I wouldn’t Google Images it, so you can’t either. Please don’t let me cheat. It’s Thomas More, so intuition says London (or at least England), and I know that Fortinbras lives and works there sometimes. I also told him that I was going to the Frick this week…is this statue at the Frick? I’ve been to the Frick, but I don’t remember seeing it. There has to be an association…this can’t be just some random Thomas More in Vatican City or Tibet or in Dr. Evil’s Secret Volcano Lair. I’d never find it. I’ll ask Heinrich too. Art is his business. Thank God Fortinbras is an extremely busy man and I am merely a recreational play toy (as it should be, as it should be), because if he found this blog I would have to kill myself, lol. 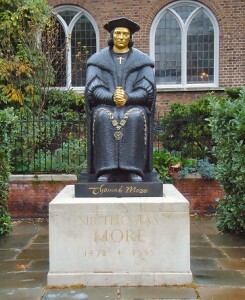 This statue is in London, at the old Chelsea Church, the parish where More lived and worshiped in London. I figured it was at a location associated with More, but was not Roman Catholic, since it says Sir not Saint Thomas More. He was canonized in 1935, and the statue looks more recent than that. I knew it wasn’t near Parliament or Westminster or the Tower of London. I’ve been there. So I googled Thomas More Oxford, then Thomas More London, with google suggesting that I add church, and it was the first non-Roman church listed, so I checked their website. There are a lot of Catholic things named after More, because the Catholic church is still trying to undo the English reformation and make England catholic again. But the Sir was a big giveaway, it can’t be a statue at a Roman Catholic institution. It might seem strange that a Church of England parish would in effect boast of their affiliation with More, since he was not a real fan of the royal supremacy on which the C of E is based. 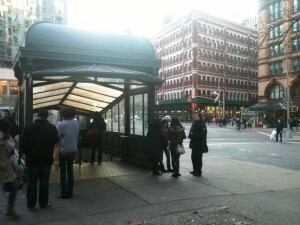 But time passes, congregations dwindle, bills have to be paid, tourist dollars are there for the taking, etc. etc. PS: Sorry to hear about Mr Crush. I thought the story was going to have a happy ending – affluent client has crush on Miss Margo – Ka-Ching!!!! Men with obsessions are like convicts – they devote incredible amounts of time to one thing, allowing them to do the impossible. Given enough time, I man can dig through a concrete wall with a spoon, or find someone on the internet. I thought I knew but I cheated and checked, hint it’s not at the frick,intuition is always good. Annnnddddd…..WE HAVE A WINNER! I just got home and checked the email and I think I’ve received 4 responses, but yours, John, was the first and accurate. I myself missed the crucial distinction between “Saint” and “Sir.” Very, very important in figuring out if the statue was at a Catholic institution. I ought to know better! I could see the C of E beating themselves up a bit for executing More. He really was–and is–a credit to their country, which also happens to be utterly safe from Catholicism at the present time. The UK is probably even safe from the C of E, lol lol. Not that the Catholic Church does not have many AMENDS to make. Brutal and cunning, and a great drag on human progress. The awesome art doesn’t compensate for it, IMO. Thanks for playing, John, you get 1st Place. Other responses came in, which I shall gratefully publish and respond to. The “Men with obsessions are like convicts” analogy is incredibly apt. They are. They really, really are. MOAR REEDER MAIL 2 COME!!! I shall respond to each piece unless you told me not to print it. Thank you so much. But now, I must go to AA, and then more AA. FML…but at least I’m getting skinny again. @ Rick: Thanks, buddy! I wasn’t cheating but I was looking through my art history and Lonely Planet/Frommers (sp?) London guides. I was almost positive it had to be in NYC or London. I have no idea who you are, but I think that you were the second reader to give me the correct answer. No idea how you knew it, but I truly hope it is because you have personally seen the statue and toured London, because London is rad and everyone should be able to visit there. I wish I saw this statue when I was in London! Thank you, Anon, and thank you for reading.